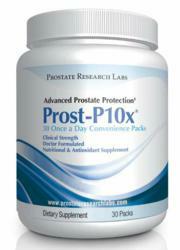 Prostate Research Labs today announced the release of Prost-P10x®, a prescription grade prostate supplement program. Prost-P10x will be available to urologists and naturopaths looking for a maximum strength clinical supplement to prescribe for their patients with prostate disorders. More than 50 million men in the United States struggle with prostate health issues. Until now, most commercially available prostate supplements have not provided the combination of ingredients or dosages necessary for a therapeutic effect, as demonstrated in clinical trials. In fact, most commercial prostate health supplements deliver only a single ingredient such as saw palmetto or beta-sitosterol. Health professionals have struggled with the lack of science and research to support their prescription of the natural prostate health supplements currently available in the mass market. With the launch of Prost-P10x®, urologists, naturopathic doctors and other wellness professionals can now confidently prescribe a thoroughly scientifically researched prostate supplement containing only the natural ingredients and dosages proven to be effective in successful clinical trials. Prost-P10x contains a combination of ten (10) organic, patented and clinically proven ingredients, measuring over 3000mg + 1000IU’s per serving. A one (1) month supply of Prost-P10x includes 30 individually sealed packets containing a daily dose of nine (9) patented “caplique” capsules. No other commercially available prostate health program provides the levels of ingredients in the therapeutic dosages in a daily serving of Prost-P10x. Men whose lives have been dramatically impacted by their prostate health now have access to the same prostate health program prescribed by Dr. Geo Espinosa in his practice at NYU Department of Integrative Urology and for which Dr. Geo has witnessed successful results first hand. Dr. Geo is one of only three naturopathic doctors in the United States who focus exclusively on men’s natural prostate health. Prostate Research Labs, LLC (PRL) is a research and development subsidiary of the Prostate Cancer Institute, LLC based in Irvine, CA. PRL develops science and research based natural supplement formulations based on independent Tier 1 and Tier 2 clinical studies to support men with prostate and sexual health disorders. Clinicians, medical practitioners, and physicians trust Prostate Research Labs to provide the highest quality, research backed supplements to support their clinical programs. The PRL Science & Research Committee is headed by Dr. Geo Espinosa, Director of the Integrative Urology Center at New York University Langone Medical Center and a former a clinician, researcher and director of clinical trials at the Center for Holistic Urology at Columbia University Medical Center. Technical formulation and scientific review is undertaken in partnership with Douglas Laboratories. Dr. Geo Espinosa N.D., L.Ac, CNS, RH (AHG), is the Director of the Integrative Urology Center at New York University Langone Medical Center and the Chief Science Officer at Prostate Research Labs. Before joining NYU, Dr. Espinosa was a clinician, researcher and director of clinical trials at the Center for Holistic Urology at Columbia University Medical Center. He is a licensed naturopathic doctor, licensed acupuncturist, a Certified Nutrition Specialist and a Registered Herbalist. Dr. Espinosa is an author of the naturopathic entry in 1000 Cures for 200 Ailments, by Harper Collins, March 2007; and “Prostate Cancer – Nutrients that may slow its progression,” Food and Nutrients in Disease Management – Maryland: Cadmus Publishing, 2009. Dr. Espinosa also serves on the editorial board of the Natural Medicine Journal. Dr. Geo is a frequent speaker at universities, medical schools and conferences on integrative health, nutrition and natural treatments for prostate disease.